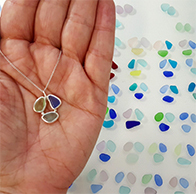 Working with a unique material such as authentic sea glass presents many challenges and many rewards. 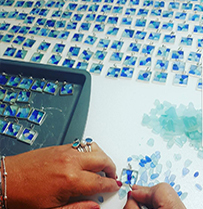 Here is a sneak peek into the process our sea glass goes through to become a beautiful piece of jewelry. Uncovering a striking piece of smooth, worn sea glass is like finding a treasure buried in the sand. 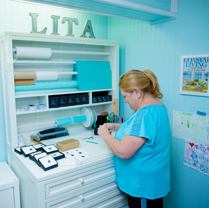 Lita Sea Glass Jewelry is located in a quite, seaside community on the south coast of Massachusetts. 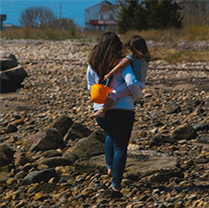 It’s rocky shores present the perfect environment for sea glass to form. 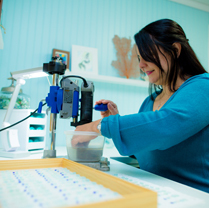 A large portion of our jewelry is made from sea glass we find ourselves! 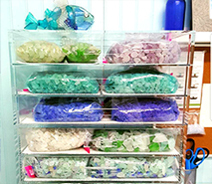 To make up the rest of our collection we purchase from professional sea glass collectors, many of whom we have been working with for over a decade. 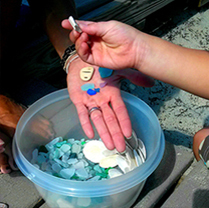 After collecting the sea glass, we put the pieces into a bowl of spring water and add a touch of coconut oil. We then place the bowl in the sunlight and add raw crystals to the spring water bath. The crystals promote positive energy and healing while the sunlight casts beautiful shimmers of colors as it reflects the sea glass in the water. The warmth of the sun energizes and purifies the sea glass and the coconut oil brings out the natural color and luster of the glass. After the spring water bath, each piece is placed on a towel to dry in the sun. 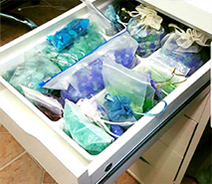 Each piece of sea glass now gets sorted by color, shape and origin, and organized into containers. Sorting by color is a tedious process. The shape and thickness of each piece of glass, can change it’s color, presenting a variety of shades and hues. In a perfect world, or should I say, a perfect ocean, the sea would spit out matching pairs of sea glass that are perfectly smooth, tear drop shapes. Oh, if only it were that easy! 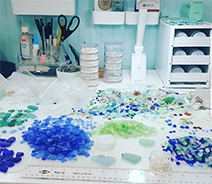 Working with sea glass is truly a labor of love. 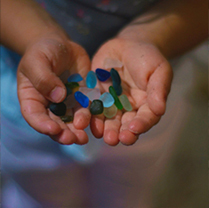 Please keep in mind we do not alter the sea glass or it’s shape in any way. Each piece is a one of a kind treasure. 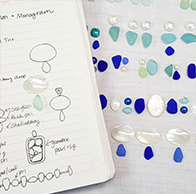 After all the sea glass is collected, cleaned, sorted and paired, the design process begins! 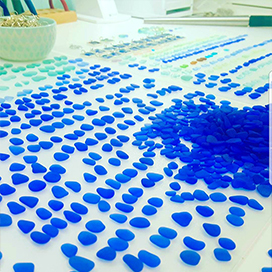 Using the art of color theory, balance, and an understanding of the way our eyes perceive color, is what makes Lita Sea Glass Jewelry just as comfortable and durable as it is beautiful. 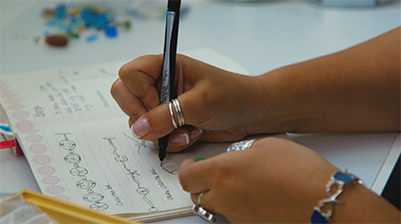 Once the design is in place, our team can begin constructing the jewelry. 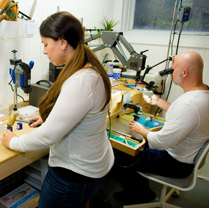 Our engineering is a multi-step process that includes drilling the sea glass, making chains and custom settings, wire forging and polishing. Each step is expertly executed with patience and diligence. Each creation is carefully packaged with cleaning instructions and story cards, before being shipped out into the world for its recipient to enjoy! We are fully committed to adhering to recycling methods in order to source and produce our jewelry in the most ethical manor possible. 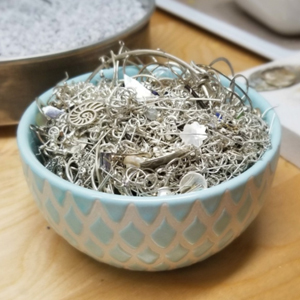 A large portion of our silver settings are created from melting down our silver scraps that we save each time we make a cut or file. All of Lita Sea Glass Jewelry is crafted using high quality, hypo-allergenic sterling silver, 14k white and 14k yellow gold as well as platinum. Our settings are hand forged and cast with a solid base and never hollowed out; resulting in durable settings. All of the gemstones and diamonds we use are ethically sourced (read more about our commitment to using ethical materials here). Although our collection of sea glass consists of glass in all qualities, we focus on using “Jewelry Quality” or “J.Q.” glass for our designs. This means that there are minimal flaws or chips on the surface of the glass. 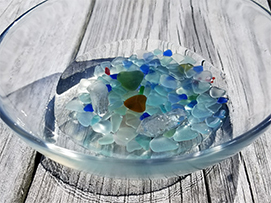 We will clearly state the condition of each piece of sea glass in the items description and will label the glass “organic sea glass” if there are any flaws or imperfections. The majority of our collection is created using solid sterling silver. Pure silver is relatively soft, very malleable, and easily damaged so it is commonly combined with other metals to produce a more durable product. The most popular of these alloys is sterling silver, which consists of 92.5 percent silver and 7.5 percent copper. Although any metal can make up the 7.5 percent non-silver portion of sterling (nickel for example) , experimentation with sterling silver has shown that copper is the best choice. We are personally dedicated to working with sterling silver created with copper because of allergy concerns related to nickel. Copper not only helps to improve the metal's hardness and durability without affecting its beautiful color, but it serves to be hypoallergenic as well. The small amount of copper added to sterling does not affect the metal's value. The price of the jewelry is affected by other factors including the labor involved in making the item, the skill of the craftsperson, the intricacy of the design, the weight of the metal used and the gems or materials involved. 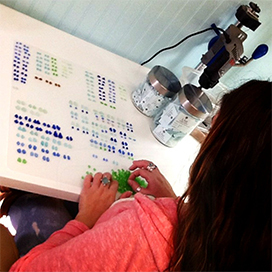 As you can see there are many steps and processes that go into making beautiful sea glass treasures! 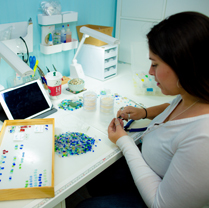 From start to finish, each piece of sea glass jewelry is truly one of a kind, made with patience and a lot of love! It’s the little things that count. 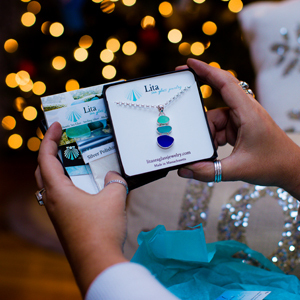 Here at Lita Sea Glass Jewelry, each piece is crafted with distinct attention to detail; smooth edges, thoughtful design and always with comfort a top priority. We believe that a perfect fit is essential, which is why we offer customized necklace and bracelet lengths along with clasp and earring back options. 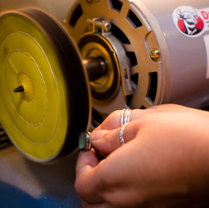 We customize each piece based on your order selections, so that each piece arrives tailored to fit you perfectly. To restore shine to the silver, use a polish cloth or liquid dip cleaner. Be sure not to use these cleaners on pearls (it will take off the "shimmer"). 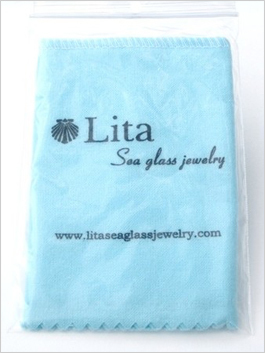 If using a cloth, use it only on the silver and not on the surface of the sea glass, as it's pitted surface can hold onto the dark oxidation that is left behind on the cloth. 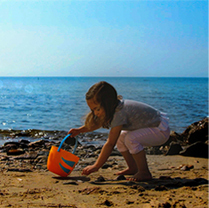 To restore vibrancy to the sea glass, use mild dish soap and a bit of ammonia diluted in water. Next, gently scrub the surface with a soft bristle brush, rinse clean and pat dry with a cloth. 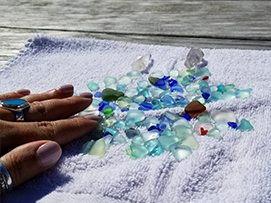 To protect the brilliance of the sea glass, finish by rubbing a small amount of mineral oil on the surface.